Legal interpreting is dangerous in the hands of amateurs. Protect yourself, your clients, interpreters and legal outcomes. Purchase this manual for a legal interpreter or bilingual employee who performs legal interpreting outside the courtroom. 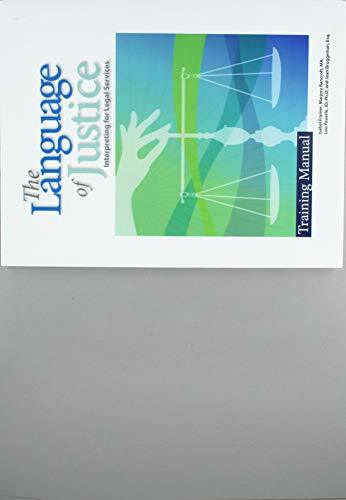 This textbook is also extremely useful for legal interpreter trainers. This publication will help interpreters who interpret for: -	Worker's compensation and disability medical exams -	School board hearings -	Domestic violence hearings -	Torture and trauma legal services -	Immigration services -	And many other areas of legal interpreting! This training manual supports community and court interpreters who perform legal interpreting in community settings. It is also the only textbook in the world focused on non-courtroom legal interpreting with an in-depth analysis of attorney-client interviews and nonprofit legal services. Unit 1: Procedures and Ethics -	Requirements for Interpreters in Legal Services -	Codes of Ethics and Professional Responsibility -	Applying Ethics and Standards of Practice Unit 2: Linguistic Mediation -	An Overview of Linguistic Mediation -	Steps for Linguistic Mediation -	Techniques and Strategies for Linguistic Mediation Unit 3: Interpreting for Legal Services -	The U.S. Legal System -	Attorneys and Clients -	Legal Terminology The resources section includes several suggested Codes of Ethics for Legal Interpreters, resources for self-study and a legal interpreting Glossary of General Terms of over 500 words.